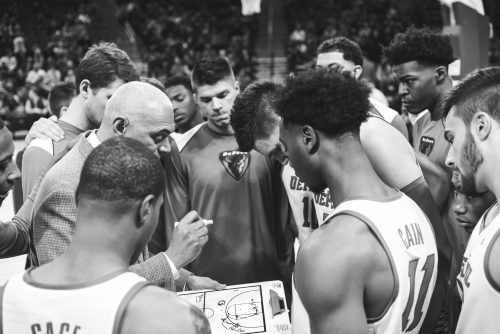 That’s how DePaul’s head coach David Leitao described the atmosphere at Wintrust Arena on the most anticipated opening night in the history of Blue Demon basketball. The game itself, however, did not conform to Leitao’s vision. 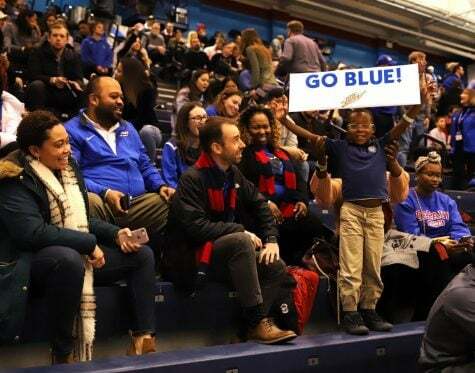 In front of a packed student section and a near sellout crowd of 10,194, DePaul’s men’s basketball team fell 72-58 to No. 14 Notre Dame in one of the toughest match-ups slated for the Blue Demons this year. Leitao says he was disappointed with the outcome of the game considering how many people dedicated countless hours to building Wintrust Arena and hoped to give those people an opportunity to see a victory. 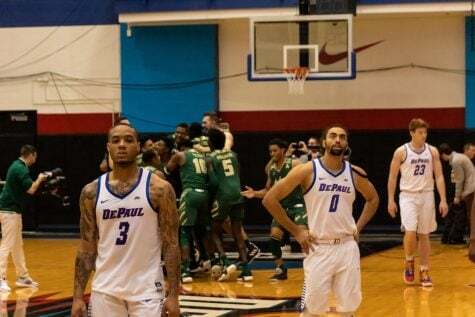 The story on the court was poor shooting from DePaul. 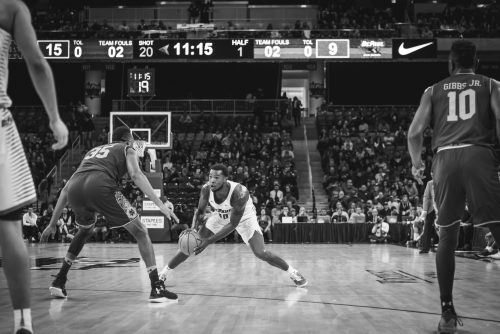 The Blue Demons failed to reach 30 percent from the field in the first half, blowing a number of high percentage looks from under the basket. 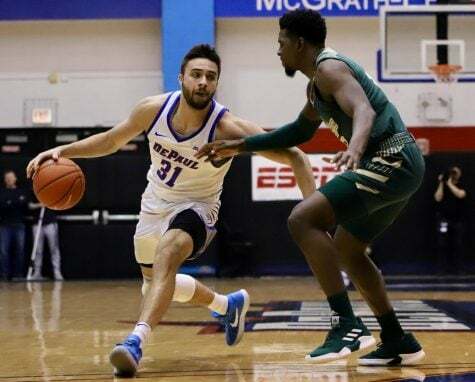 As the preseason hype predicted, DePaul seemed eager to get the ball in the hands of Max Strus, who took all of his first-half shots from behind the arc, going 1-7 from the field and 2-3 at the foul line. 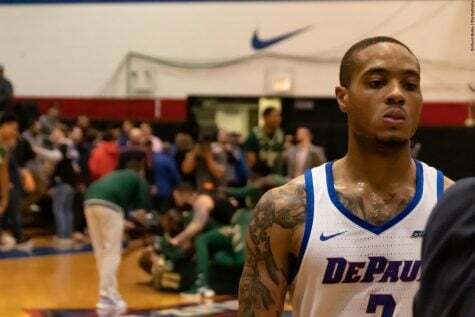 DePaul’s deficit grew to 8 points as they neared the midpoint of the first half, but battled back to even the score at 22 with under five minutes to play. Winturst saw its loudest moment in response to a Eli Cain to Tre’Darius McCallum ally-oop dunk with 8:22 to play in the first half as the crowd — particularly the student section — erupted, pushing the momentum in favor of the home team. 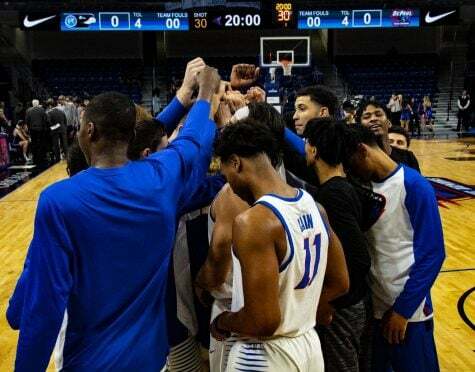 The Blue Demons ended the first 20 minutes trailing 29-25, led by McCallum and Devin Gage with eight-points-apiece. Cain and Strus rounded out the scoring effort with four and five points respectively. 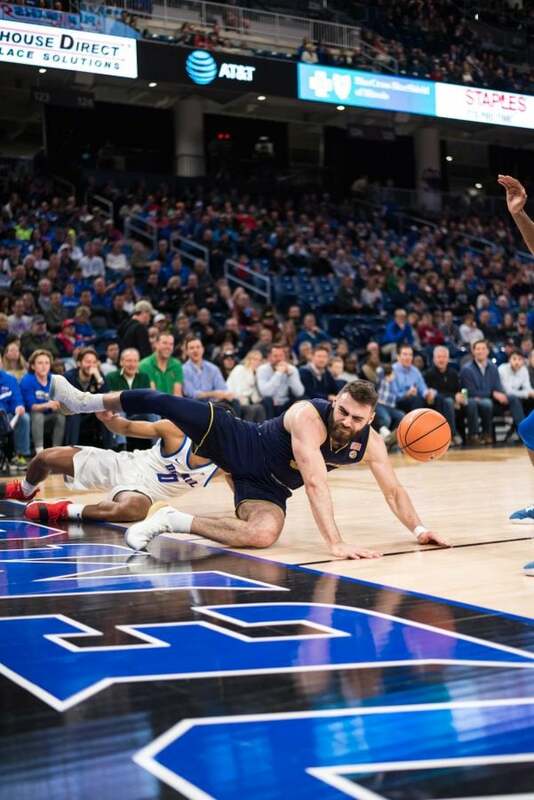 Notre Dame head coach Mike Brey said he was impressed by Gage and “Strus just had a bad night,” but expects him to be a force throughout the season. 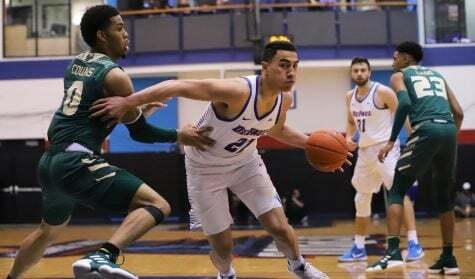 DePaul narrowed the margin to one, but the team’s inexperience put a quick stop to momentum. Strus continued to be active but unsuccessful for most of the his night, which was highlighted by two missed ally-oop dunks. The first of which came on a breakaway off of a block from Gage, who tossed the ball up to Strus, who smashed the ball violently into the back of the rim for no score. “I thought we came out strong, but slacked in the second half,” Gage said after the game. 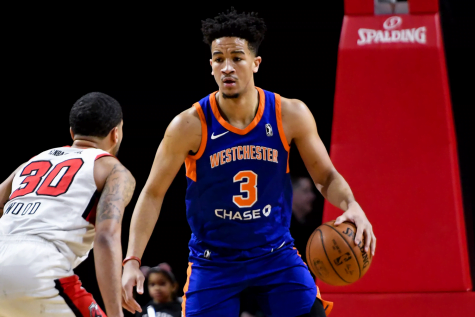 Strus ended his Division 1 debut going 3-13 from the field(3-12 from behind the arc) for 11 points, adding five rebound, two assists and a block. Notre Dame took their next possession down the court and capitalized with a three-pointer from Temple Gibbs, who led the Irish with 21 points on the game. Then, no more than a minute after Strus’s blow dunk, he missed another, this time on an ally oop pass from the baseline on the inbound. The Irish took the rebound and converted another three-pointer, this time from Matt Ferrell, who went 5-9 from three-point land (5-11 FG) for 15 points on the game. Cain started to take control in the second half, adding ten to his four first-half points, but he couldn’t lift his team past a veteran and disciplined Notre Dame. The sophomore finished the day with 14 points, five rebounds and a team-high three assists. 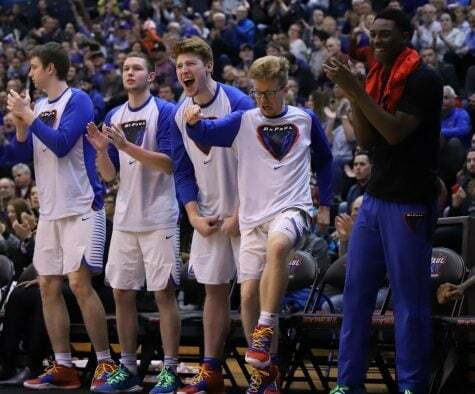 From that point on the Irish continued to prove themselves as one of the top teams in the nation and let the Blue Demons make their own mistakes by forcing shots as time ticked off the clock. “I think an older group that has won together (in the past) kind of showed up for us in the last ten minutes of the game” Brey said. The game ended with a commanding victory for the Irish, but the night’s story line goes beyond basketball. Wintrust was the real show — the multi-million dollar and mulit-institutional project that took over four years of planning and execution to complete. 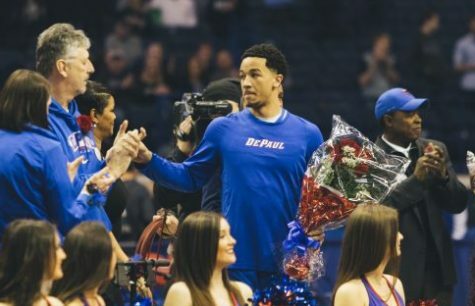 Leitao recognized DePaul’s Athletic Director Jean Lenti Ponsetto in his post game comments, giving her credit for getting the project off the groud and pushing it along to completion. Notre Dame’s head coach responded enthusiastically to questions about the atmosphere in the arena. Brey says coaches traditionally don’t like to open the season on the road and challenge themselves, but this was a different situation.